Hello. I'm Robyn Steiner, Owner of Mathnasium of Thornhill, your neighbourhood math-only learning centre. We help kids in grades 2-12 understand math by teaching the way that makes sense to them. 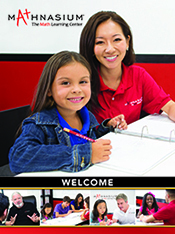 Mathnasium Thornhill opened its doors on September 6th, 2016. We are located in the Centre Street Deli plaza on Centre street, near New Westminster Drive. Our math-loving staff is passionate about helping your child become more proficient in math and of course, make math make sense! We offer year-round programs as well as summer programs. Call us today at (905) 763-6284 for a RISK FREE Assessment! We recently joined and are very happy with the program! I never thought my daughter would ask to come so often to work on math but the staff make it motivating and fun! They are very prompt with responses re:scheduling which makes it easy! Overall we are very pleased with the program and progress! Mathnasium has been extremely helpful to me daughter who will habe attended for 2 years before she heads off to University. She has improved both her skills and her appreciation for math! The staff are fantastic! We like the flexibility of schedules and that the kids can 'make' money and use their math skills in practical ways while there! My son has been enjoying his math sessions and is always enthusiastic in attending. He has made great progress at school. The staff are friendly and accommodate our requests when booking his math sessions. We appreciate how flexible and accommodating the scheduling can be to meet our busy schedule. Melissa has made our experience a very pleasant one. She is very understanding and accommodating. My son loved going. Never complained or rolled his eyes. He was keen to go and keen to stay. Thanks for motivating him to learn and understand mathematics. My daughter loves coming to Mathnasium and her multiplication skills are really improving in only a few short weeks. I can see a difference in her confidence as well! The staff are great. She really likes all of the instructors. Our son, Thomas, has gone from hating math (because teachers in school don’t know it and can’t teach it) to enjoying it - because he understands it. The staff at our Mathnasium have been patient with him - and he is now getting good marks in math. Melissa and her team are doing a great job! My daughter looks forward to coming to each class! The staff at mathnasium Thornhill were great and very approachable. We think Mathnasium Thornhill is the absolute best. Incredible staff, beautiful facilities and you really do make math fun.